It’s no surprise that the world’s aging population is creating a greater demand for increased staffing in senior living communities. To meet that need, it’s imperative that industry professionals start addressing the issue locally and educate potential employees about the many job and career opportunities that exist across the senior living spectrum. What can senior living communities do to get an edge over other service and health care providers when recruiting among the local labor pool? Effective recruiting campaigns use community engagement methods such as job fairs and internships to supplement the wider outreach of online job boards and media ads. “I think those wide-casting opportunities bring people to the door, but nothing takes the place of being one-on-one with individuals and being able to have that conversation about what the job is,” said Dan Loon, vice president of associate advancement and education at Legend Senior Living. Recruiters need the opportunity to discuss the realities of each job with potential hires and to assess their interpersonal skills and attitude. Employee Referrals. Across the board, employee referrals are the most effective recruiting tool at well-run communities. Current staff members who are satisfied with their jobs are much more likely to recommend a community to their friends who are looking for work. Internal programs to increase employee satisfaction can result in more referrals as well as provide another tool for recruiters to use when engaging with prospects. 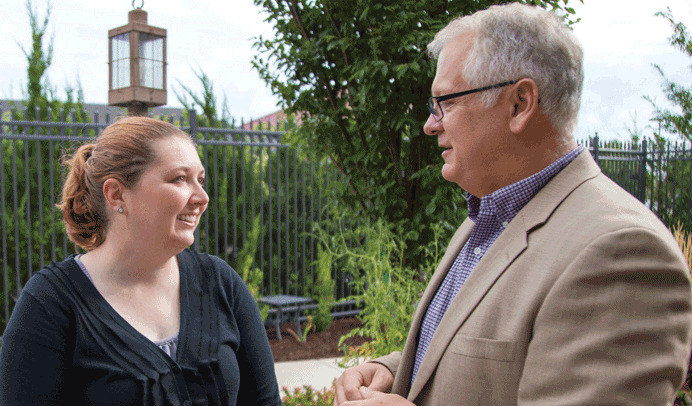 Legend Senior Living highlights its associate advancement program when speaking with potential new hires. “If people know that they have an opportunity for growth, both professionally and within the company, I think that’s a huge recruiting win,” Loon said. Recruiting cards. Custom-printed recruiting cards are a simple, effective technique for informal, on-the-spot recruiting. “We have cards that say, ‘You gave me great service, think about a job at Brightview,’” said Vicki White, director of talent and employee relations at Brightview Senior Living. “If we’re out at a restaurant and we get really great service from a dining person or we’re at the makeup counter and they have great customer service, we give them a card.” Supplemented with a brief conversation about the rewards of working in a particular senior living community, this can be a very effective technique. Targeted recruiting. Communities can use social media, email, and snail mail to reach out to specific demographic groups with tailored messages and invitations to recruiting events. Demographics to target include CNA, health care, and culinary students looking to start their careers; high school and college students looking for part-time evening and weekend work; recent retirees who need or want to supplement their incomes; empty-nest moms looking to get back into the workforce; veterans; and legal immigrants. School involvement. Engaging in the classroom with students in high school, college, and trade schools is a valuable way to catch their attention. “What we need to do as an industry is get in front of them, so they really get a good understanding of what opportunities are available,” Loon said. “Because so many times, especially in the health care industry, they may only think of a hospital or a nursing home.” Legend CEO and founder Tim Buchanan has been a frequent guest speaker at Wichita State University (WSU) and Loon is an adjunct professor there in the College of Health Professions. In addition, Legend provides two fellowships for WSU graduate students enrolled in the College of Health Professions. The students conduct research projects at Legend’s three Wichita-area communities. Internships. These are an excellent way to provide college students in the health care, management, and marketing fields with experience in the senior living industry. It’s important to offer them a flexible schedule and to provide them with meaningful work. Ensuring a pool of talented and dedicated workers in the future depends in part on planting the seeds of interest now. 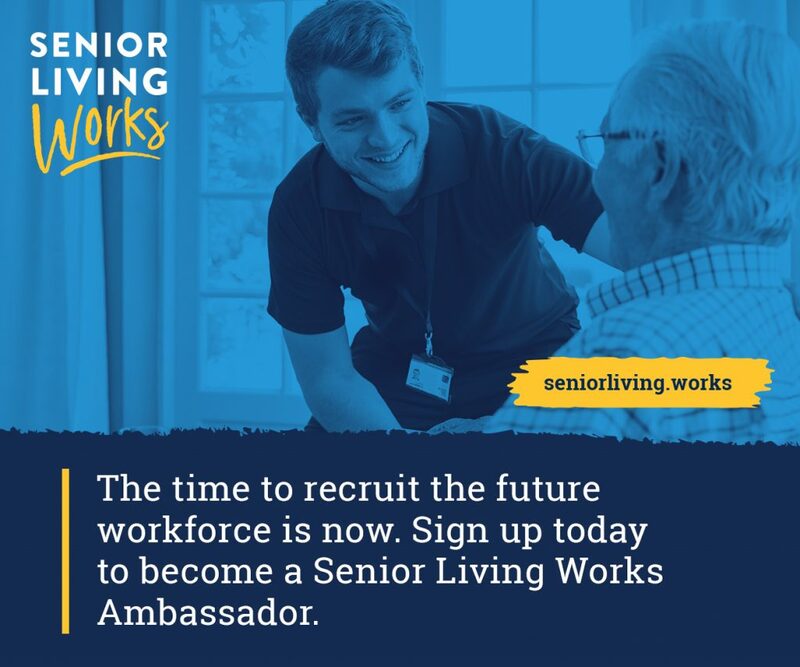 This means engaging with youth of all ages, even as young as elementary school, to create goodwill and promote the rewards of working in the senior living industry. “Recruiting and awareness of the industry can and should begin as early as grade school,” Carle said. Other industries are taking a strong approach to this tactic. The Women in Trucking Association created a trucking badge for the Girl Scouts, which requires the girls to learn about the trucking industry and familiarize themselves with the inside of a semi cab. Communities can also establish reciprocal volunteering relationships with area schools. Middle and high school students are often required to do community service hours as part of their curriculum. Senior living communities can build relationships with guidance counselors, teachers, and administrators to make sure their communities are on the list of places to volunteer. In return, staff members may volunteer at the school as another way to present kids with a positive view of senior living. The bottom line of using community engagement tactics in recruiting is to start with a well-managed community and then to reach out early and often to the most likely demographics. Maintain recruiting efforts on a consistent basis and use a variety of methods to stay front and center in the minds of potential employees. Above all, remain proactive. Getting out there and engaging with candidates face to face is one of the best ways to reach high quality candidates who will provide years of quality service to the communities that attracted them.